Photo Left: Field action – Matthew Millward (centre), with Brooke Sweeney (left), Leon van den Heuvel and Zane Sweetman (far right). Photo Right: Te Aroha College silver medallists – back (from left): Coach Sam Stockley, Caleb Cradock, Luke Harvey (Vice-Captain), Leon van den Heuvel, Alfred Howell, Zane Sweetman, Fyn Downham-Smith, Braye Stewart, Pauline van den Heuvel (Assistant Coach), Nadia Denney, Jeremy Blair, Julie Sweeney (Manager). Front (from left): Matthew Millward (Captain), Oliver Marshall, Amy Shotton, Brooke Sweeney, Sara Brunsdon, Tyla Burge. Absent from photo: Tayla Sweeney. 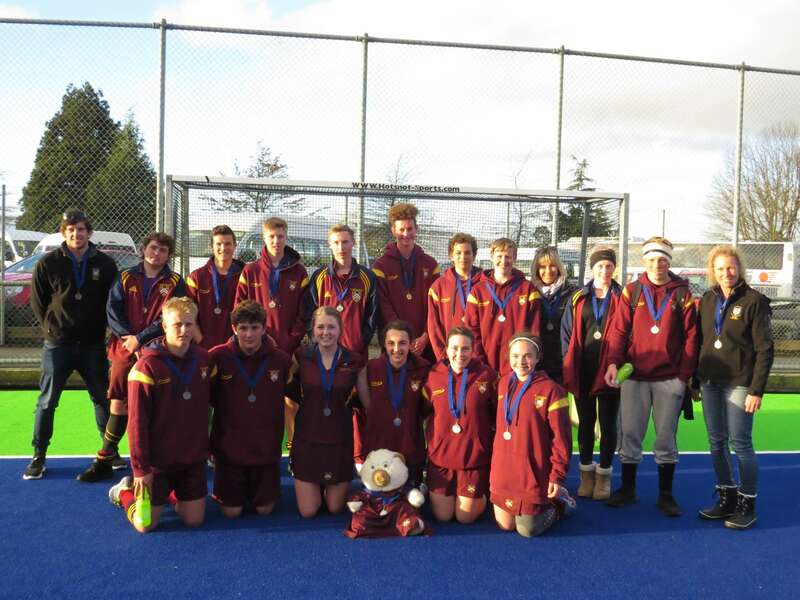 Te Aroha College made it three-in-a-row when they took home silver medals at the North Island Secondary Schools Mixed Hockey Tournament recently. 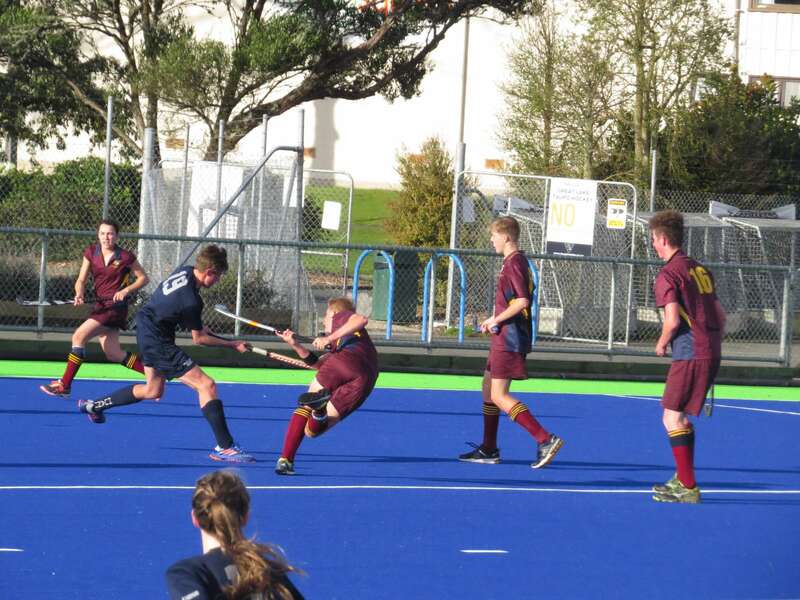 Unbeaten in pool play, the Te Aroha team rose to the occasion to defeat Tuakau College in the quarter-finals (5-0), and then Rotorua Lakes High School in the semi-final (1-0) to earn their finals spot. Out of the 17 competing teams from throughout the North Island, the two finalists were a repeat of last year, with Te Aroha facing their rivals Huanui in a closely fought contest on day five of the tournament held in Taupo. Despite scoring first, Te Aroha was eventually defeated 5-2 in the finals, coming home with a well-deserved second placing overall. The team ended the tournament with a 5-win and 1-loss record. They scored a total of 30 goals and had only 6 scored against them. 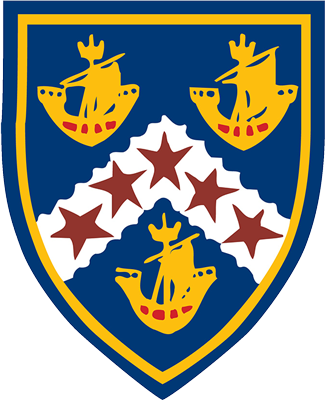 Pool play results were: 6-1 win against Bream Bay College, 7-0 win against One Tree Hill College, 9-0 win against Henderson High. Te Aroha’s top goal scorers were captain Matthew Millward (7) and vice-captain Luke Harvey (7). Close behind was Leon van den Heuvel on 6, Tayla Sweeney on 4, and Alfred Howell on 3. Tyla Burge, Sara Brunsdon and Zane Sweetman all scored 1 goal. Coach Sam Stockley said that having eight players on the scoreboard, and many others involved in good passing that led to the goals was indicative of the great teamwork that helped Te Aroha College to finals position. Stockley himself is a former silver medallist in the mixed hockey, having been a player in the first Te Aroha College team to take the field in the North Island competition and come away with success in 2011. Now, returning as a coach six years later, he has again helped to secure silver for the team. Te Aroha also won silver last year and in 2015, making the 2017 result a three-peat. Most Valuable Player of the tournament for Te Aroha this year was Zane Sweetman for his consistently powerful game both on offence and defence in the midfield. 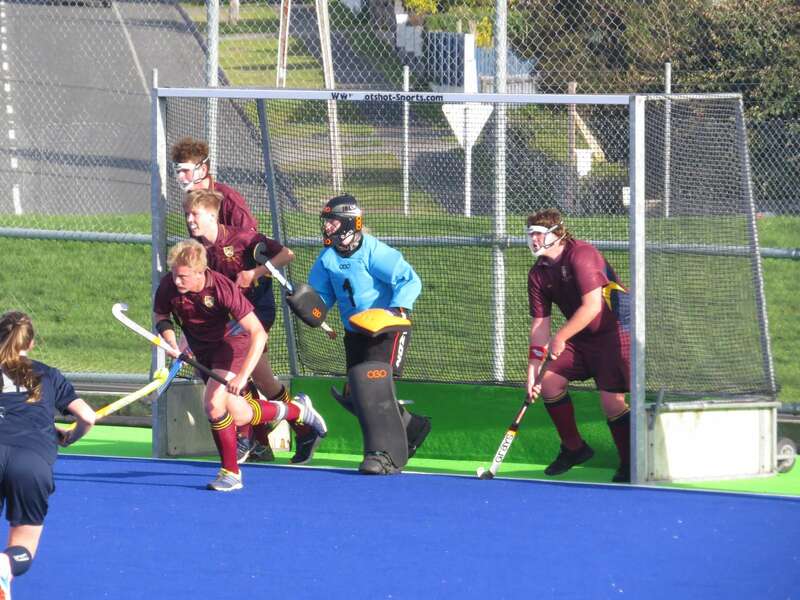 Te Aroha College defend a Penalty Corner – Matthew Millward (first runner), Leon van den Heuvel (second runner), Zane Sweetman (left), Caleb Cradock (right) and goalkeeper Nadia Denney.